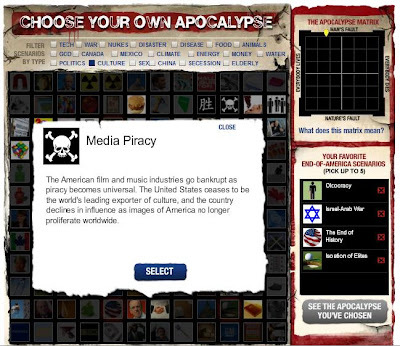 Copyrights & Campaigns: Slate: Piracy may lead to apocalypse! As part of its years-long campaign to ruin August, Slate has decided to present its readers with "144 potential causes of America's future death." All 144 are listed here for your convenience. Or you can play the nifty "Choose your own apocalypse" game. I must say, I'm impressed that Slate has identified "media piracy" as End-of-America scenario #22, right between "end of English" and "decadence" (18 places below "loose nukes," though 30 above killer asteroid!). does that make matt oppenheim jesus and you a prophet? - The copyright industry employed 8% of the total US workforce. So yeah, the illicit cannibalism of this industry would wreak havoc on the country. "The United States ceases to be the world's leading exporter of culture.."